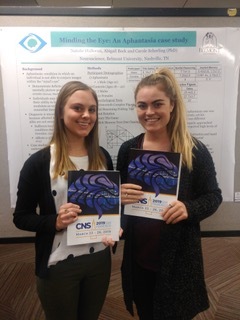 Belmont Neuroscience students Abigail Beck and Natalie Halloran presented a case study at the Cognitive Neuroscience Society 26th Annual Meeting in San Francisco March 23-26. The meeting brings together researchers from around the world to share latest discoveries in cognitive neuroscience. The four-day event included invited symposia, symposia, posters, awards, a keynote address and opportunity for attendees to connect with colleagues. Beck and Halloran presented their poster outlining a case study investigation on memory and visuospatial capabilities in Aphantasia, a unique condition where the subject lacks the ability to internally represent visual images in his or her mind. Their poster was well-received and Beck and Halloran recruited new case-subjects to test in Fall 2019, while attending the conference. Their presentation was overseen by Assistant Professor of Neuroscience Carole Scherling.